Any 90 degree angle bracket less than 2″ in length should work. This project also includes a bonus Alexa installation. 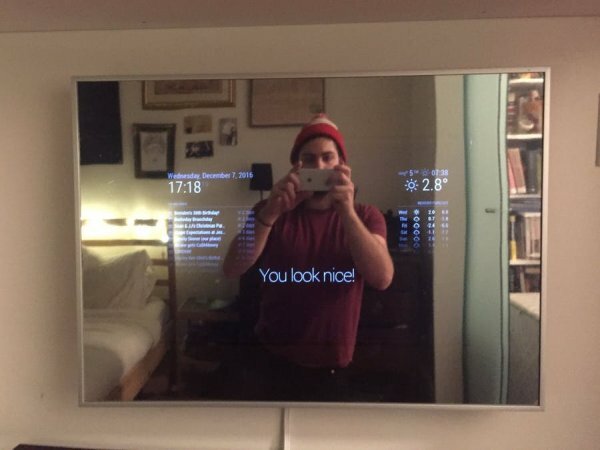 Your smart mirror will be great without this, but it’s nice to have a voice assistant in your mirror to ask tough questions or control home automation. You’re done! Let it sit for a while before moving, as it hasn’t really stuck in place until all the soap mixture dries. Now it’s time to build the frame. Use your most basic woodworking skills to size the wood frame, and then use the 90 angle brackets to attached the inner corners. 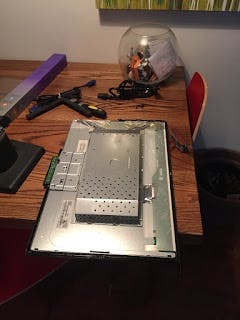 Then screw 4 small screws in the front and back corners to hold the monitor in place.